Arterritory.com and Anothertravelguide.com have prepared the following descriptive list of exhibitions in the satellite program that distinctly stand out from the crowd. When the Biennale returns to Venice every other year, its regular visitors have a good opportunity to evaluate how the city has changed over the last two years. Immigrant street vendors, a standby of the urban landscape, have added a new item to their usual stock in trade (e.g., knock-off Louis Vuitton handbags) – the selfie stick. This tragically comic gizmo allows the tourist to fulfill his/her holy obligation to friends and family of taking a self-portrait in front of some recognizable landmark and immediately posting it on a social network. My experience in the city has given me cause for contemplation, and if you can make it to Sant'Antonin Church without being whacked in the head with somebody else's selfie-stick, your contemplations will have already gained a material and visual form. 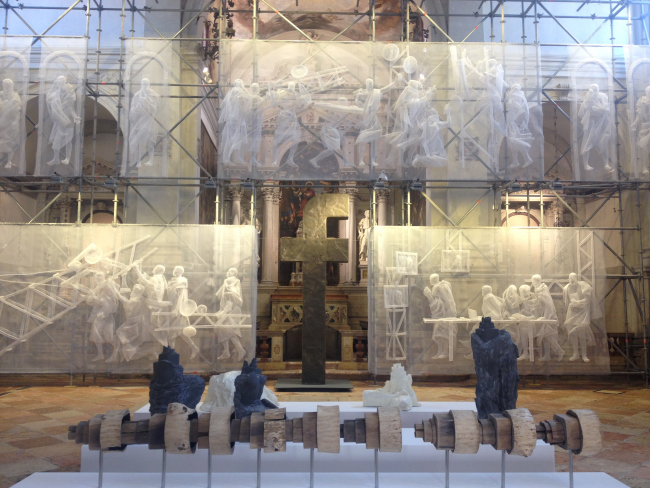 Here the site-specific installation by the Russian artist duo of Recycle Group (Andrey Blohnin and Georgy Kuznyechov) has transformed the holy space into the image of a new, 21st-century “religion”. 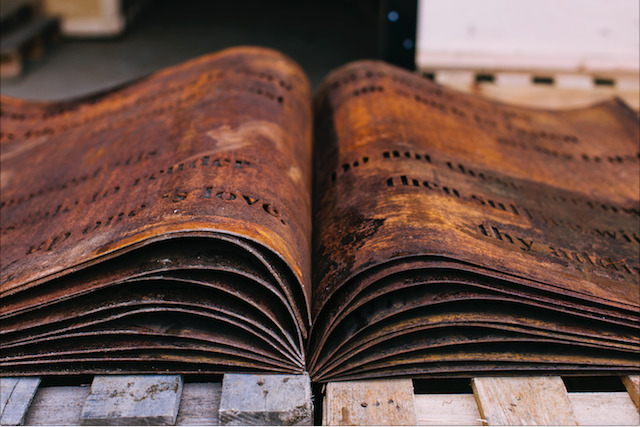 Namely, one in which Our Lord in Heaven now sits on the edge of an iCloud virtual server while the apostles receive brand-new sacred knowledge from the “holy scripture” of virtual information. This is a good way to expose people who have no intention of viewing art to a “bite-size” art experience. Up until autumn in Venice's only Burger King fast-food restaurant, along with your burger, fries and Coke, you can learn from your paper tray liner all about the American avant-garde film pioneer Jonas Mekas. In place of the usual MTV music videos, the restaurant's plasma TVs show video works from Mekas' web-diaries, a project he's been working on since 2006. 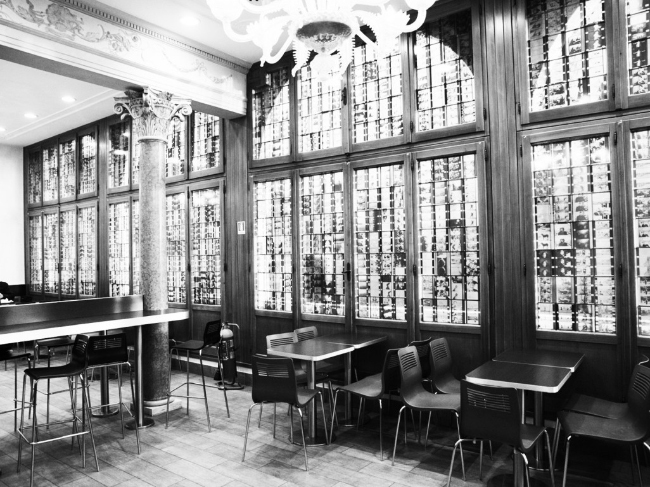 The restaurant itself has been transformed by way of vinyl window decals featuring Mekas' photographs, creating a distinct stained-glass effect. And lastly, in the Burger King's courtyard, loudspeakers play a 70-minute track featuring the sounds New York City and the eulogies that were read at Andy Warhol's funeral. Among other things, The Internet Saga is the only project at the Venice Biennale dedicated to digital culture; at its center is art on the internet, and the study of the development of audiovisual language in the age of information technologies. Mekas' participation is unsurprising – having begun working via YouTube in 2005, he became one of the first web-stars of contemporary art. 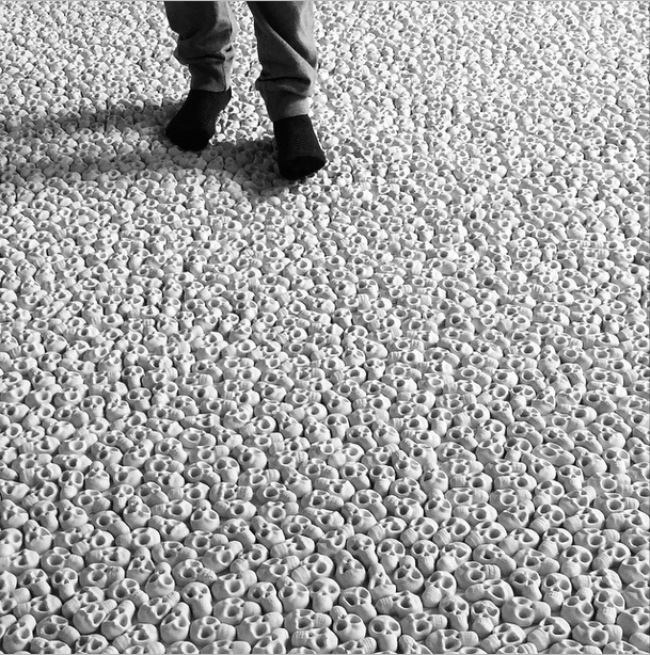 As part of the same project, Mekas' works are also being presented in Spazio Ridotto and at www.internetsaga.com. One of the most challenging exhibitions at this year's satellite program, in terms of sensory perception, is The Union of Fire and Water. 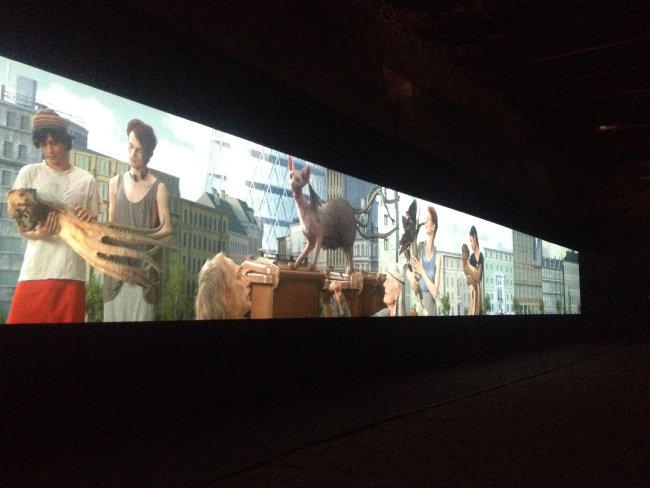 It is Almagul Menlibayeva's and Rashad Alakbarov's view of the relationship between Venice and Baku throughout history. The location of the exhibition, in the Palazzo Barbaro, is significant in terms of its narrative context – in the 15th century Giosafat Barbaro, onetime owner of the Palazzo, extensively traveled throughout Azerbaijan, thereby becoming the first ambassador from Baku (Azerbaijan's largest city) to Venice. A brick lion created by Alakbarov lies in the weak sunbeams entering the dusky inner courtyard of Palazzo Barbaro. Steep stone stairs lead into the just-as-shadowy rooms of the Gothic palazzo, the larger part of which have not been dressed-down as usual for exhibitions. In this case, the contemporary artworks fit into the natural grandeur of their surrounding environment in a truly interactive way. The sounds of magical and mystical music literally lure pedestrians of the Castello district into the small inner courtyard of Palazzo Grimani. At the source of it all is a kinetic sound installation by artist and composer Aaron Taylor Kuffner, its concept based on gamelan – a genre of traditional Indonesian ensemble music. 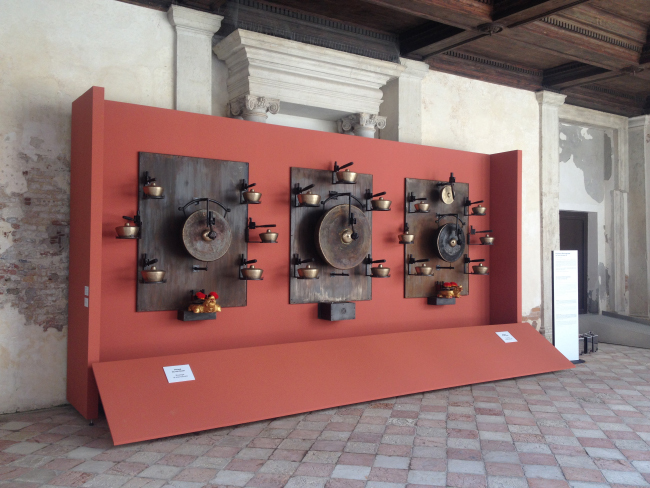 This modern-day version of gamelan – or as Kuffner calls it, the “gamelatron” – is robotic in nature, and its orchestral bells and gongs lull the listener with its meditative sounds... in preparation for entering the richly decorated interior of the Palazzo Grimani to view the Frontiers Reimagined exhibition. Although North and South Korea find it impossible to get along in their geopolitical part of the globe, this is not the case in Venice. Dansaekhwa is yet another exhibition of the satellite program in which art nobly unites (the other is India's and Pakistan's co-production, My East is Your West). Presented here is the Korean art phenomenon of the 70s and 80s known as “dansaekhwa”, or one-color painting. Many may be tempted to liken this art form to the Western monochrome or minimalism schools of painting, but keep in mind that dansaekhwa has its own historical context, aesthetics and form of execution which has physical, spiritual and emotional aspects. 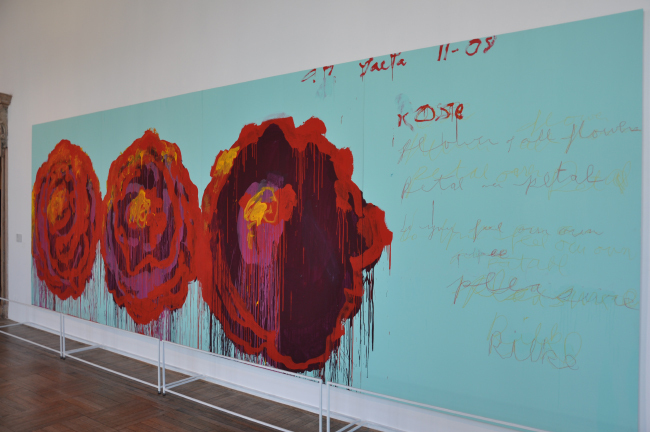 The works on display by the Korean artists have been created by a special canvas-activating technique which consists of various methods of covering the canvas with paint – such as applying paint on the reverse side of the canvas, soaking the canvas, cracking the soaked and dried canvas, and peeling or scraping off the paint, and so on. Truth be told, this is one exhibition where it's worth listening to the guided tour. 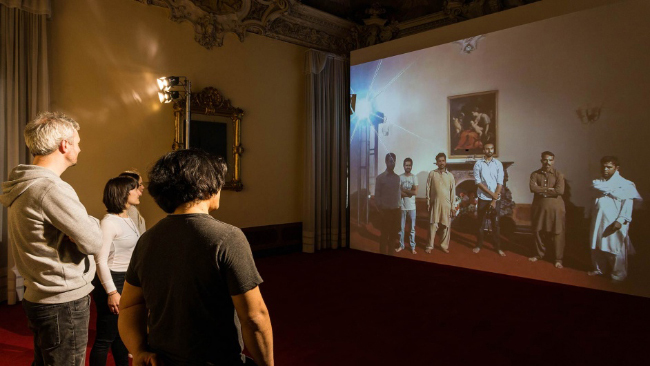 For the first time in the history of the Venice Biennale, the two historically conflicting nations of India and Pakistan are presenting a united exhibition. 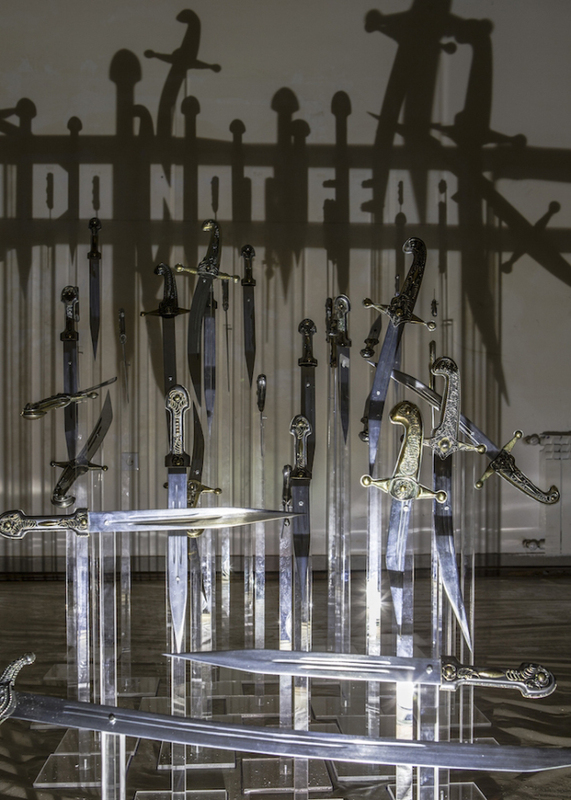 The exhibition is the fruit of the cooperative labors of two internationally renown artists – Shilpa Gupta from India, and Rashid Rana from Pakistan. Both artists grew up in an atmosphere of spiteful conflict, and in their exhibition they reflect on how things would have been had the two nations not split up. 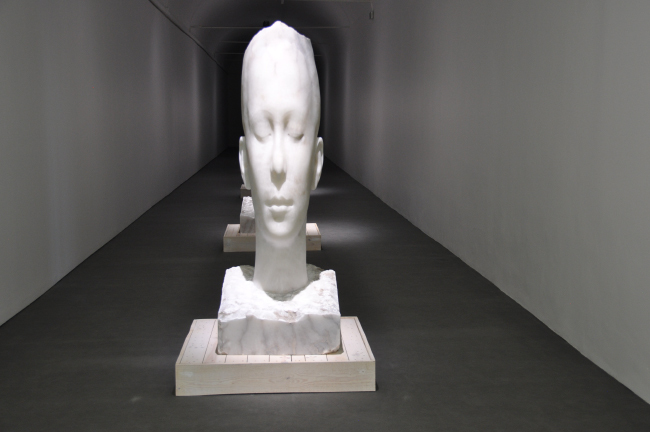 In the dark and cool space of Magazzino del Sale, viewers sit as if hypnotized. Perhaps this is because in the marathon of exhibitions that is the Venice Biennale, video works are the only legitimate means that one can employ to sit down and rest one's feet. But really, the absurdity and utopia imagined by the multi-channel HD video installation Inverso Mundus, or “Reverse Worlds”, is truly enthralling. 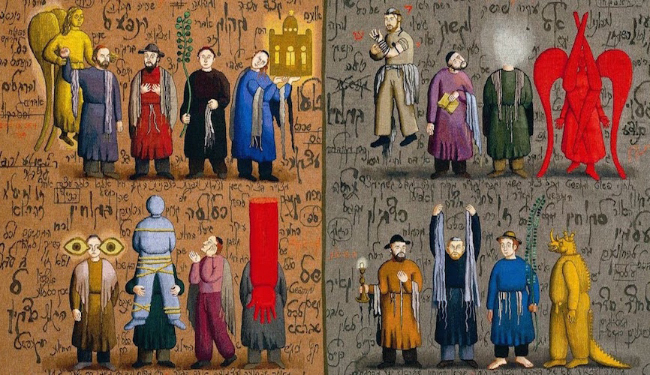 Up until the middle of September, the cultural foundation Fondazione Querini Stampalia is showing the works of Russian artist Grisha Bruskin. Bruskin's career experienced a turning point in 1988 when the film director Miloš Forman bought his painting The Fundamental Lexicon. Part One. At the time, the soviet authorities valued the piece at two thousand rubles. An absurdly low price, but the main thing here was the name of the purchaser. A few months later, these two thousand became 416,000 dollars in the first (and currently, only) Sotheby's auction to be held in Moscow featuring art of the Russian avant-garde and soviet era. 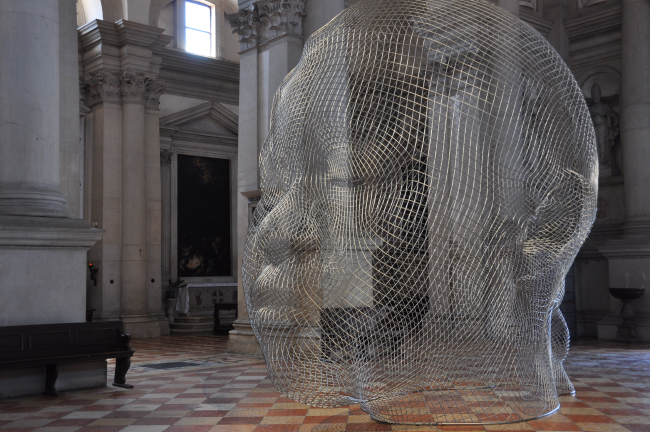 The installation by Catalan artist Jaume Plensa in the Church of San Giorgio Maggiore (built by Renaissance genius Andrea Palladio in the 15th century) is one of the most spiritual and meditative art projects of the Venice Biennale. Called Together, it is made up of two figures. One is a head made from stainless steel wire mesh, hung from the ceiling like openwork netting. 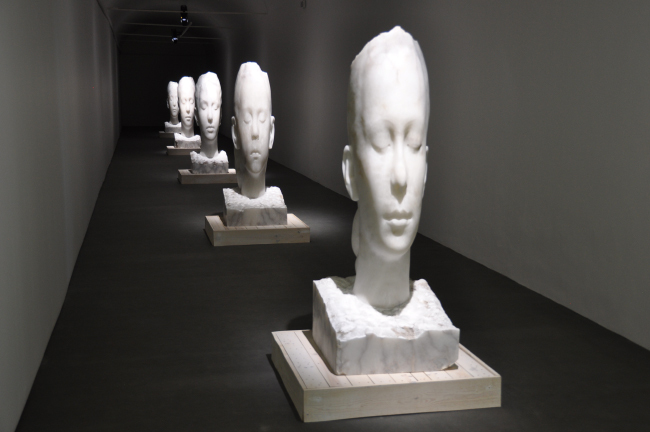 Depending on where one is standing and at what angle, the image of the head optically changes it shape and form, giving the piece an additional aura of mysticism. The symmetrical lines of Palladio's architecture “enter” the head through the netting, thereby literally becoming a part of the head. One sees, at the same time, both the inside and the outside of the body – both the physical form made of matter and the metaphysical self. Across from the head, also hanging from the church's ceiling, is the second sculpture, this one made of die-cast letters from eight world languages, arranged in the shape of a priest's hand giving holy benediction to his congregation. 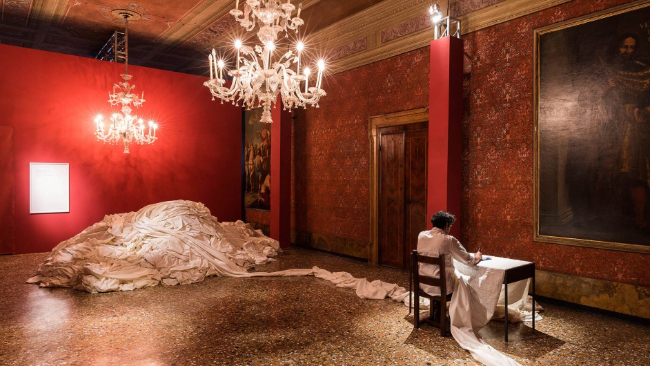 In a Venice that is currently over-saturated and overflowing with art, Polish artist Magdalena Abakanovicz's (1930) large-format installation – or more precisely, a multi-figured sculptural artwork – is one of the most emotional and visually inspirational experiences one can have. In the dark space, two separate areas – both in unmistakable conflict with one another – are illuminated. 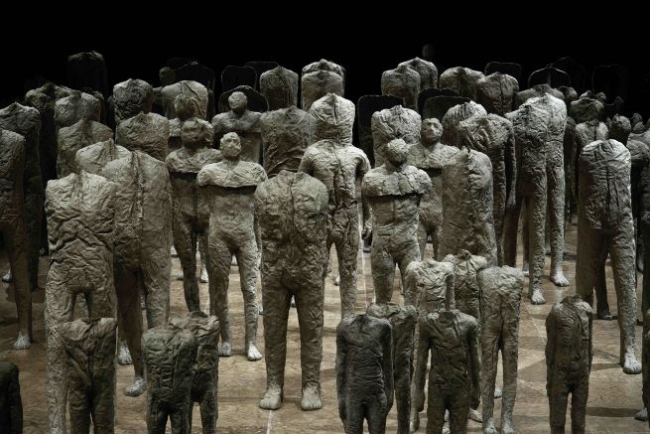 One consists of 110 human figures, some standing, some marching; some with heads, some headless. The other area features a strange, lone animal – a mutant; and a palpable atmospheric tension that is also mournful, in a way. Abakanovicz's form of expression – sculpture made from fabric and textiles – is her signature mark in today's art world; her innovative contribution to sculpture has been valued for several decades now. The figures' rough, imperfect surfaces and their life-size scale make them weirdly realistic; upon first view, they evoke an illusory balance between the real world and the unreal. The relationship between the individual and a crowd has always been an element in Abakanovicz's 50+-year career. 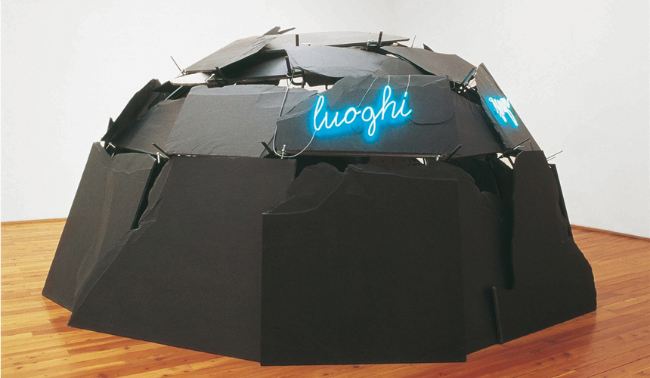 She actually has a whole series based on this subject, and she has traveled with it to exhibitions around the globe – including to the Venice Art Biennale in 1980, when she represented Poland, and again in 1996, when she exhibited her piece Crowd I in what was the Italian pavilion at the time. 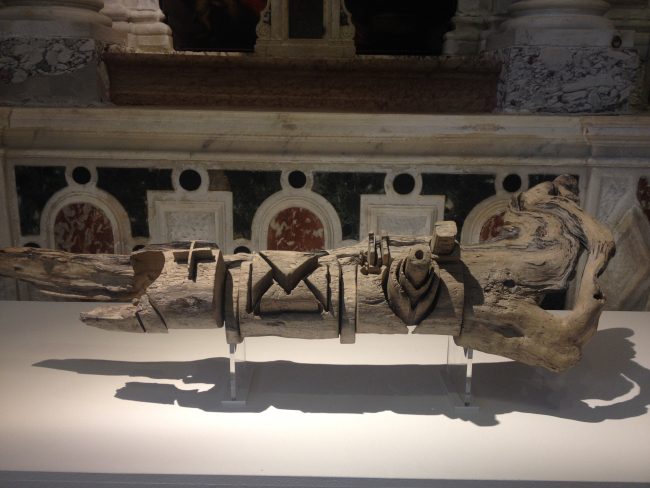 One of the most intriguing satellite events of the Biennale is the exhibition Proportio, as curated by Axel Vervoordt, art collector and dealer in antiques/art. 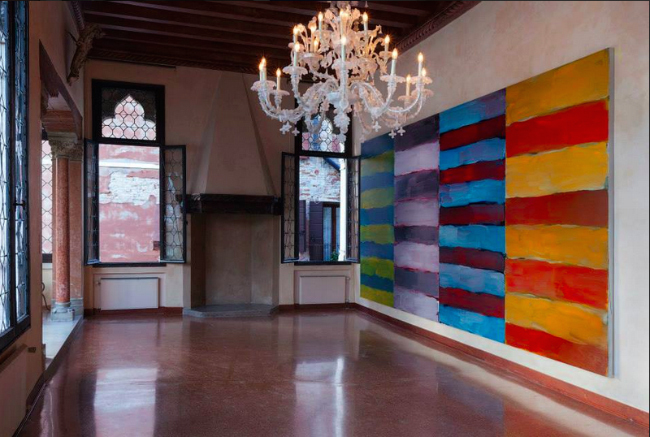 It is housed in the Gothic Palazzo Fortuny, which was originally built for he Pesaro Family and then later acquired by the Spanish fashion designer and scenographer Mariano Fortuny (1871-1949), who set up his studio there. An especially notable invention of Fortuny's is the iconic Fortuny Moda Lamp – it caused a “revolution in lighting” in terms of both theater scenography and photography, where it still in use today. Fortuny was also a passionate art collector, and arranged his eclectic, multi-period art and artifact collection throughout the palazzo. After his death, his wife gifted the palazzo and its contents to the city of Venice; today it is open to the public only during exhibitions. The exhibition curated by Vervoordt is a story of proportions – in art, music, architecture and nature – and their meaning in the world that we inhabit today. It is about the unrelenting duel between order and chaos. Along with works by the Old Masters and 20th-century masterpieces, also on view are architectural models and contemporary art pieces. 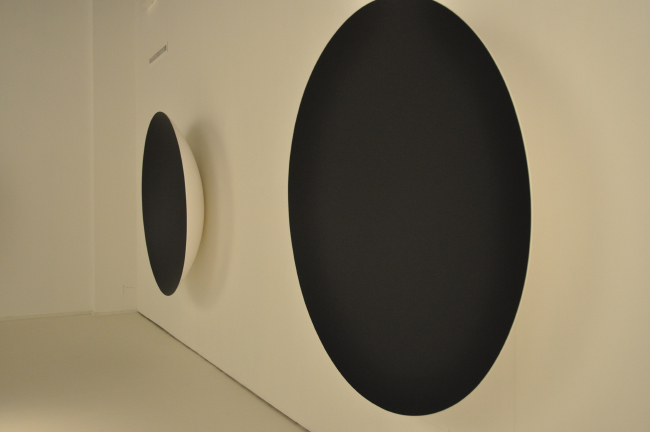 One whole room has been devoted to the Indian-British artist Anish Kapoor and his multi-sensory installation made up of spherical planes that literally pull the viewer in like a black hole, leaving one at a complete loss in terms of sense of time and space. 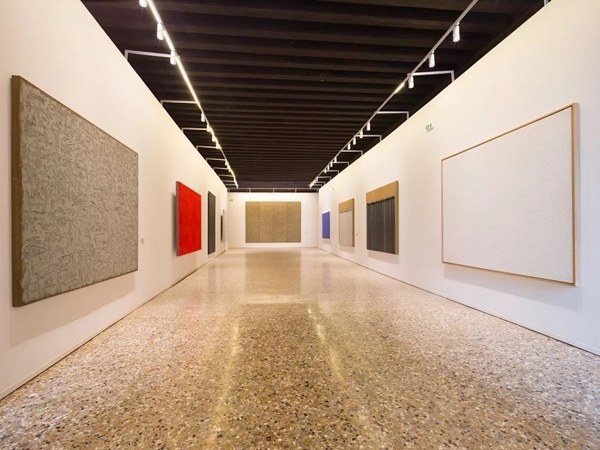 Also included in the exhibition are artists such as Marina Abramović, Antony Gormley, Albert Giacometti, Sol LeWitt, Le Corbusier, and Mario Merz, among others.